This is a simple and inexpensive breakfast casserole that uses refrigerator biscuits. Need to feed the family or unexpected guests in pinch? This easy biscuit sausage casserole recipe will do the trick. Enjoy! 2. In a large skillet, brown sausage. Reserve 2 T grease. Drain sausage; rinse with warm water. 3. Return reserved sausage grease to skillet. Add flour; stir well. With stirring, add 3/4 c. milk. Cook over medium heat until gravy thickens. Stir in sausage. Season with salt and pepper. 4. Add beaten eggs and remaining 1/4 c. milk to a clean skillet. Scramble eggs until done. Season with salt and pepper. 5. Place scrambled eggs in a 8 x 8 in. baking dish. Cover with sausage gravy. 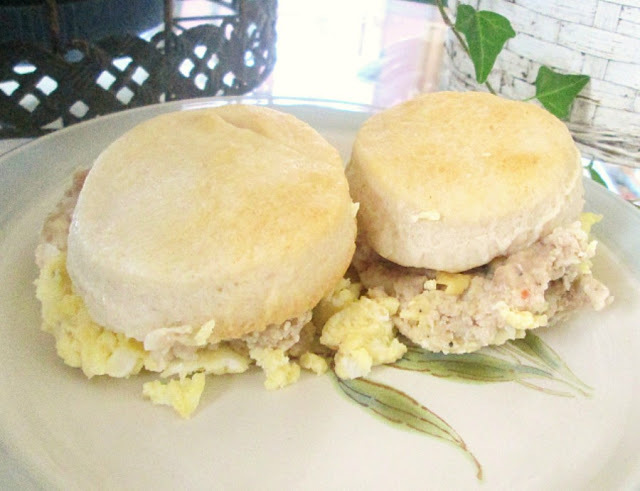 Top with uncooked biscuits. 6. Bake at 400 degrees until biscuits are golden, approx. 10 min.